In the late 1950s research was undertaken to reduce the drag on large commercial cargo ships. Many different ideas were tried and continue to be tried today in the ongoing development of the science of Naval Architecture. With model testing and advanced knowledge of hydrodynamics, the bulbous bow was formulated typically giving a 5% reduction in fuel consumption over a narrow range of speed and draft. This was significant for a large ship crossing vast oceans at a time when the cost of fuel was rising. Patrick J. Bray. 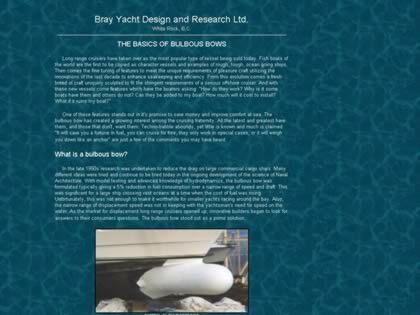 Web Site Snapshot: If available, above is a snapshot of the The Basics of Bulbous Bows web site at http://www.brayyachtdesign.bc.ca/article_bbows.html as it appeared when this site was added to the directory or last verified. Please Note that Boat Design Net has no involvement with the above web site; all content and images depicted in the above thumbnail are the property and copyright of The Basics of Bulbous Bows unless otherwise noted on that site. Description: In the late 1950s research was undertaken to reduce the drag on large commercial cargo ships. Many different ideas were tried and continue to be tried today in the ongoing development of the science of Naval Architecture. With model testing and advanced knowledge of hydrodynamics, the bulbous bow was formulated typically giving a 5% reduction in fuel consumption over a narrow range of speed and draft. This was significant for a large ship crossing vast oceans at a time when the cost of fuel was rising. Patrick J. Bray.